Philosopher Georg Wilhelm Friedrich Hegel had a profound effect on modern thought. 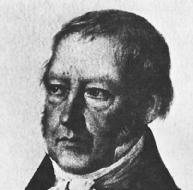 Hegel wrote his earliest work in 1807 and his groundbreaking Philosophy of Right in 1827. An idealist, he explored the nature of rationality in an attempt to create a single system of thought that would comprehend all knowledge. Among his chief contributions was developing the hegelian dialectic, a three-part process for revealing reason that ultimately influenced nineteenth- and twentieth-century theories of law, political science, economics, and literature. Especially in the late twentieth century, scholars debated the ideas of Hegel for their relevance to contemporary legal issues. Hegel's theories arose partly in response to those of his predecessor, the Prussian philosopher Immanuel Kant. Believing that perception alone could determine what is real, Kant had provided a concept of reason that Hegel was able to use in building a complete theoretical system. In doing so Hegel created his own form of the dialectic (a method of critical reasoning), which he divided into three parts. Essentially, it held: (1) A thesis (idea) encourages the development of its reverse, or antithesis. (2) If these two combine, they form an entirely new thesis, or synthesis. (3) This synthesis is the beginning of a new series of developments. Hegel believed that life eternally forms itself by setting up oppositions. But most importantly, he operates within a biblical hermeneutics rooted in the 19th-century rationalism of Georg Hegel, who held reason to be higher than faith and revelation. Seemingly everyone from Plato and Aristotle, via Immanuel Kant and Georg Hegel, to Max Weber, Jacques Derrida, Martin Heidegger, Richard Rorty, anti E.
He begins with a sympathetic but critical account of a whole range of European philosophers of the 19th and 20th centuries, ending with Ludwig Wittgenstein (including Soren Kierkegaard, Georg Hegel, Karl Jaspers, Martin Heidegger, Friederich Nietzsche, Claude Levi-Strauss, Sigmund Freud, Carl G.